Whether climbing a ladder, or on the ground, the AIMS Drill holster keeps your drill on hand when needed, securely stowed when not. Made from Rugged 1000D Cordura constructed to last a lifetime, it is the perfect accessory for industry professionals to DIY home-owners. Barrel locked elastic cord keeps drill in holster while extra heavy SCUBA webbing for holster rigidity. Front slotted webbing to carry a variety of extra bits or to attach AIMS pouches, fits most bits up to 4 1/2". Crafted right here in the USA, Atlas 46 products are made with high standards to ensure you get a proper lifetime of value. VERSITILE: Patented AIM System quick attach for mounting without removing belt and fits up to 2" belts. 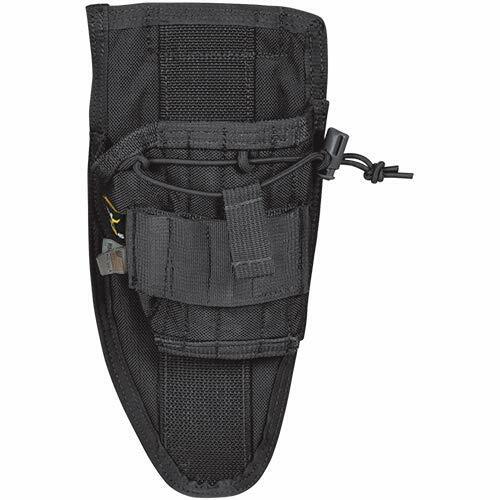 SECURE: Barrel locked elastic cord keeps drill in holster and extra heavy SCUBA webbing for holster rigidity and clothing protection from most bits up to 4 1/2"
View More In Tool Pouches. If you have any questions about this product by Atlas, contact us by completing and submitting the form below. If you are looking for a specif part number, please include it with your message.